The 'October 2017 Psychologist board exam results', conducted by Professional Regulation Commission (PRC) Board of Psychology are released four (4) working days after the last day of board examination. PRC recognizes the first 10 examinees who garnered the highest examination rating in any of its administered licensure exam. 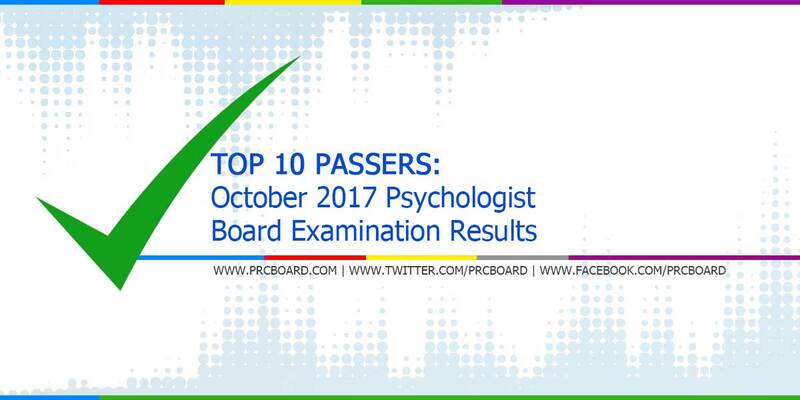 Shown below is the complete list of October 2017 Psychologist board exam top 10 examinees including the school they're from as well as their rating. The list is courtesy of the Professional Regulation Commission. As mentioned in the main page of this article, through PRC Resolution 2016-1019, official results will be published by November 7, 2017 (Tuesday). Meanwhile, the specified release date is not final as official results may also be out online earlier or later than the target date without prior notice. You might also want to check the overview of the topnotchers during the previous licensure examinations of Psychologists. The tabular presentation of topnotchers showing the name of the examinee, his/her school alongside the rating (%) is summarized right after. PRCboard.com is one of the trusted websites that provides timely and reliable information in any board examination conducted by PRC and other related government agencies. For verification, we recommend to refer to PRC official website. Meanwhile, to keep updated on the official result of October 2017 Psychologist licensure exams, you may also follow us at our social media accounts via Facebook and Twitter.